This is a picture I created for use as a facebook cover photo for Christmas Eve. Merry Christmas. When facebook changed its layout the other day, it caused quite a stir. All over my news feed people were crying foul, posting pictures like this one. It all seemed a little over the top to me. I responded by posting a picture that read “I am appalled that the free service that I am in no way obligated to use keeps making changes that mildly inconveniences me.” I’ve been on Facebook since 2008. It has added much to my life. It makes it easier to share pictures of my kids with family. I have reconnected with cherished friends that I would have thought were lost until the next reunion. It has given me a platform to voice political opinions, informative articles, and to seek out readers for this blog. I have gotten infuriated over other’s rants, and have probably caused others to wonder, “what is that guy’s problem?” I have 468 facebook friends, whom I can now group into distinct lists. Some of the 468 I barely even remember meeting the first time. Some I never really wanted to reconnect with – they just sort of “appeared.” All the while I have scoffed at those that mocked facebook. All of the complaints against the big blue F seemed silly and uninformed. I had my security settings mastered. I could spot a virus video link a mile away. I changed my password frequently to avoid spammers. Now however, I am starting to have doubts. Insecurity is starting to creep in. I think it started for me when I watched the movie “Social Network.” No longer was Facebook some anonymous website with a clean logo. It suddenly had a face – with insecurities, faults, and frailties. Are you telling me that Facebook was created because some nerd wanted to impress a girl? This did not bode well. But then I realized that almost everything awesome ever created by a man was probably done to impress a girl. Yet my fortress of certitude that I had built around facebook started to crumble. When I read about how difficult it is to delete a facebook account, I started to get worried. My fall-back argument to every facebook criticism was always “I could always delete it.” Now I am not so sure. Yes, you can delete your account, but is it ever really deleted? Recently a friend of mine announced he was getting off of facebook. He asked if there was a way to backup what you have stored on FB. It turns out that there is a program to backup everything that you have ever put on FB. Every picture, every comment, every note, every link. EVERYTHING. Which begs the question. If I can back it all up, then where is it all stored? I’ve read a few interesting articles. Some are pretty alarmist, like this one called “Facebook’s new terms of service: ‘We Can Do Anything We Want With Your Content. Forever” This one is called “Ten Reasons Why You Should Quit Facebook.” Here is another article called “The Web Means The End of Forgetting.” It all seems like an invasion of privacy. It is starting to make me a little squeamish. 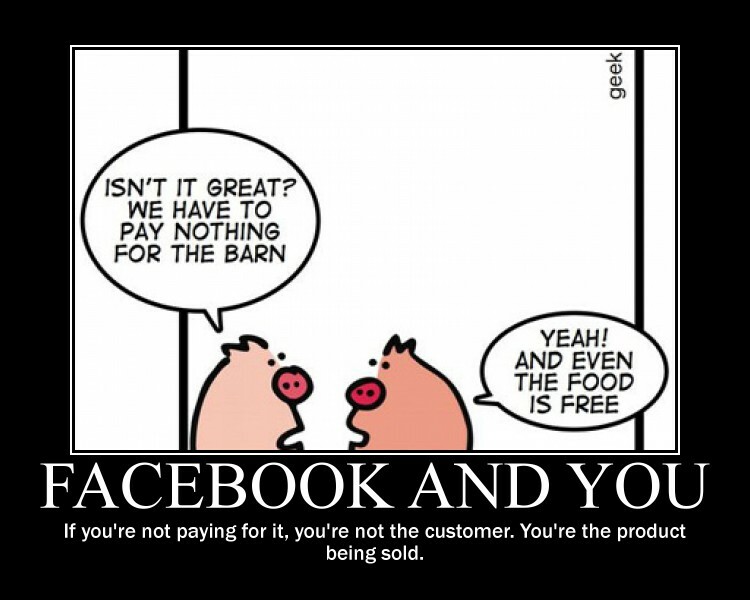 Yet it is hard to say they are invading our privacy when everything that we put on facebook is completely voluntary. I know that there is no such thing as privacy on the internet. It is an illusion. I operate understanding that everything I put on faceboook is permanent. This unfortunately, is not an assumption I had for the first couple of years on facebook, but live and learn, right? Then a couple of weeks ago I saw my own cell phone number on my facebook profile. I am positive that I never entered that. How did that happen? So now this is popping up on people’s statusses. Please do me a favor and move your mouse over my name here, wait for the box to load and then move your mouse over the “Subscribe” link. Then uncheck the “Comments and Likes”. I would really rather that my comments on friends and families posts not be made public, Thank You! Then re-post this if you don’t want your every single move posted on the right side in the “Ticker Box” for everyone to see! I’m posting this not only for myself, but also so that my friends and family will know to ask others to do the same if they would not like their every move on facebook! Then I read somewhere that this really doesn’t do any good. It is all so confusing. And that is my point. I don’t think any of us really know what is going on. It seems like things are moving incredibly fast. Laws haven’t caught up. Social mores are being created as we speak. What’s too much on FB? What does it mean to be in community while sitting at a computer? I guess what I’m trying to say is that I no longer see Facebook as a benevolent entity helping people get connected. It is what it is – a multibillion dollar business designed to streamline advertising and gather consumer information. Am I okay with that? If I know that I’m being exploited, is it really exploitation? The problem is I just don’t know. In five years, what are we going to say about 2011? Are we going to laugh at those that had worries about Facebook the way we now chuckle at those that refuse to buy things on amazon? Am I going to regret photo-documenting my family’s life? Is something I said, did, or posted going to cost me? hurt my family? get me in trouble? I don’t know. I don’t think any of us do. I’m not deleting my facebook account. For better or worse, it has become a part of my life. I can’t in good conscious encourage others to join though. But if you are on facebook, do me a favor and “Like” the Fat Pastor. I have 65 fans, and I’d really like to get over 100. Here’s a cartoon that I think sums it up pretty well. From Top Left: Winking smiley, the twitter bird, the cross and flame of the United Methodist Church, hulu, The logo for the greatest blog ever written, the Orwellian behemoth known as Google, an iphone, the logo for Riverside United Methodist Church, another winking smiley, Oh My Gosh (cry of astonishment), facebook, youtube, Laugh Out Loud (something people are rarely doing when they type those letters) an icon for a Bible iphone app, Yahoo. I wonder how many people would be able to look at the picture above and know what all of these pictures mean. Considering one of the images is the logo from this blog, and another is the logo from my church, I’m guessing that very few would know all of them. I wonder though, how many from our churches would know what the little blue bird represents? How many people in our congregations haven’t the slightest idea what a tweet is? 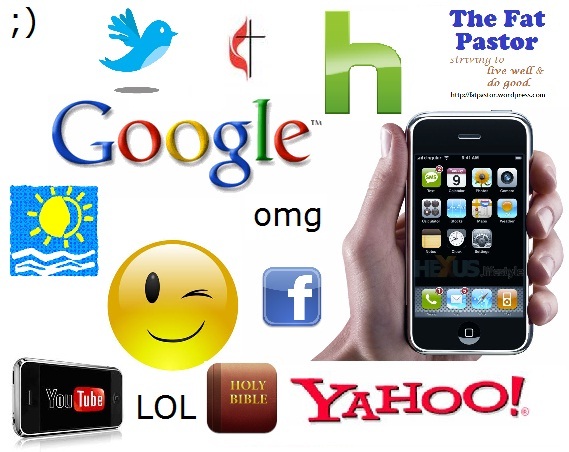 Many of the same people who are (sometimes proudly) technophobic, digging in their heals against the use of social media, technology, and other new forms of communication, are also despondent about the lack of young people sitting amongst them in their pews. They talk longingly of the “good old days” when the churches were full and the Sunday school was bustling, and the building was growing, and the budgets were plentiful (never mind that the good old days also included silence on issues like domestic violence, racial equality, and an utter lack of understanding or compassion surrounding gender issues). Youth culture has always been misunderstood by adults. That is why it is called “youth culture.” Youth have a different way of communicating and relating to their friends. They have a different understanding of what it means to be a citizen, what good music is, and what is funny. Youth are no longer satisfied with consuming media – they want to participate in it. Things like twitter, facebook, youtube have given young people a platform to broadcast every detail of their lives. And the funny thing is – people are listening. A video of some kid lip syncing a song in front of their computer camera has been watched by millions of people. Millions! Big downtown cathedrals that were filled in the 50s might have reached 5,000 – maybe. All this boils down to this: If you want to communicate to young people, you need to know a new language. The church needs translators. In order to reach people with the good news of Jesus Christ, people need to be able to speak the language of those we are trying to reach. And if we are trying to reach young people, you have to at least know what those things are. The images above represent vast changes in culture and language. Google used to be a number. Then it was a website. Now it is a verb. Hulu – and other technologies – have rendered such cultural stalwarts like Primetime Network Programming obsolete. There are no networks. There is no prime time. Facebook has changed the way we think about things like privacy, photo albums, prayer, politics, and even wedding invitations. There is a new language, and if we are going to translate the language of Jesus Christ – the language of grace, forgiveness, compassion, justice, and love, we need to know the new language. It doesn’t mean that you have to run out and get a twitter account, but you should at least learn what it is. Translation however, is about more than facebook pages, blogs, and tweets. Translation is about taking the time to build relationships. It is my deepest conviction that the heart of the Gospel message is relationship. It is about our relationship with God and our relationship with one another. The best way to translate the Good News of Jesus Christ is to live the Good News of Jesus Christ. The best way to teach a young person about a faith that changes the world is to go out and change the world. Jesus Christ has the power to transform lives, but it doesn’t always happen with a well-reasoned argument or an insightful Bible lesson. It happens when someone who is already in love with Jesus tells somebody else about that love. We need translators of the Gospel. We need people who are willing to take the time to live authentic relationships with young people. And authentic is the key. We cannot put on airs. Young people are savvy. They see through BS. That is why knowing the language is so important, we can’t fake it. Translation only happens when people sincerely care. Translation begins at home. Young people might rebel, but their most important influence always has been and always will be their parents. But here’s a warning for you: If you are willing to be a translator of the Gospel, that means you are willing to put the power of the Bible into the hands of inexperienced, energetic young people. It means that you are going to open up the power of the Holy Spirit to speak directly to people that might not think about church the way we think about church, people that might not think of music the way we think about music, people that might not think about God the way we think about God. They might not think of our institutions, our meetings, our buildings, our worship, or our barriers in the same way we think about them. Young people with the Holy Spirit might not do things the way we want them to because they might stop listening to us and start listening to God (Kendra Creasy Dean, Almost Christian, p. 130). So be warned. Translators are needed, but translate at your own risk. The tagline. Inspired by Dr. Minor Myers, I have added the tag line “Striving to live well and do good.” It is the mission statement of this blog. The logo. It incorporates a new color scheme (blue and tan), the name, tagline, and html address into a 200×200 frame, which is usable in a lot of social media pages. The Facebook Page and badge. On the right sidebar you will see the logo as a Facebook badge. 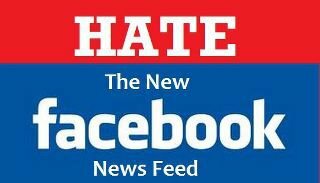 Click on it, and you will be a follower of the Fat Pastor on facebook. You will receive updates when there are new posts, as well as occasional status updates (and tweets!). As of now, I only have 15 followers. I need you, the readers, to increase that. Invite your friends to “Like” the Fat Pastor. The Twitter page and badge. If you are into twitter, you can follow the Fat Pastor on twitter. It took me a few hours, but I finally linked the FB page with the Twitter account. Right now I have three followers. One total stranger. My wife, and Mike Slaughter (one of my pastoral heroes). The Email Subscription. If you want to get an email when I finish a post, you can subscribe at the bottom of the page. The only thing left to do is to buy the domain http://www.fatpastor.com. It doesn’t look like anyone is using it right now, but someone else owns it, so it will cost more than the usual $10 at godaddy. Oh well. So there, the Fat Pastor has now reached 2009. I’m proud of the work that I’ve done, and I’m proud of this page. I hope you enjoy, and share it with friends. So, as a middle-aged man living in rural Illinois, my days are not exactly filled with thrilling adventures. One of the most exciting moments of my day comes when I get on facebook and read the replies to all the witty comments and statusses (stati?) I wrote. Nothing compares, however, to seeing that I have a Friend Request. Seriously, getting a friend request is the best. It means that someone, somewhere saw my name and picture and thought, “Yeah, I want to be friends with that guy.” The best part is the anticipation of the moment after clicking on the link, but before it is revealed who my new friend is. Could this be some long-lost friend, some dear part of my past that will bring back a flood of memories, somebody I will exchange dozens of emails talking about old times, and possibly even meet for a beer on a coming Friday night? Is it a youth from a church I used to serve, seeking my advice or coming to tell me how I was a positive influence in their life? Or is it some guy I went to grade school with, but have not talked to in 20 years, and was really doing just fine not talking to him. “Who?” These are the people that you have to check “mutual friends” to narrow things down a little. This is the guy you had a class with your junior year, but never really talked to. This is the girl that was your roommate’s girlfriend’s friend that came over one time. This is the fraternity brother that was a freshman when you were a senior and you didn’t live in the house, or it might actually be someone’s little brother who you partied with once. Basically, this is the worst friend request. You feel obligated to accept, because ignoring friend requests is just rude, but you haven’t seen this guy in 15 years, and you’re not exactly sure you want him to see pictures of your family. These don’t happen too much. Of my 319 friends, I’d estimate that I didn’t have any idea who about a dozen of them were at first request. I think a couple of them have actually removed me since then. How funny would it be if you got an update everytime someone removed you as a friend. How’d you like to have “Josh Smith has removed you as a friend” on your live feed. “I remember that guy” These are the people that you once were friends with, but honestly had not thought about this person in years. You were on a team together. You had a few classes together. You worked in the same office for a year or two. You said “hi” to each other in the hall, but you knew nothing personal about the person. The last time you talked, it was when they signed your yearbook, and it said “It was nice knowing you. Have a fun summer. Good luck in college.” And it says “college” because they didn’t know where you were going to school. This is someone you add because if you bumped into them at Easy Street Pub or the Village Tavern, you would want to be able to look them in the eye. And you have about 30 mutual friends and they might post pictures from HS of friends you had that will make you laugh. You might right on their wall once after becoming friends. You might make a comment or two on their status if you can think of something clever. You do not exchange messages or comment on pictures. You might be in their mafia. Of my 319 friends, I would roughly estimate that 50 of them fall into this category. “Casual Friends.” This the person that, when you shared something in common, you were pretty good friends. When you were in the same office, or in the same fraternity, or on the same team, you hung out some. You went out after work a few times. You ran in the same circle. But when life changed, you drifted apart. You graduated and went to college. You graduated and got jobs in different cities. You moved. She moved. You have her email, but it ends in .edu, and you doubt it still works. Your first comment after accepting the request is, “It’s great to see you on facebook. We should catch up.” But you don’t. Well, maybe you do a little, but you don’t really say anything more than is already on your profile. “I live in —–, I’ve been married for ——, I work for ——-” That’s about it. I probably have another 100 of these friends. “Historic Friends” These are the friend requests we are all waiting for. These are the guys that stood up at your wedding. This is the guy that slept over at your house when you were kids. This is the girl that you kind of liked, but never asked out. These are the people we write on their wall, “It’s great to see you on facebook. We should catch up.” And then you actually do with a few exchanged messages, and maybe a chat or two. If they’re not online, you look at the profile and find out if they are a Democrat, or if they turned into an a-hole (I think I just lost a few friends). You check out their pictures, especially the album titled “Old School.” You form a carefully crafted comment on their status, and hope to God that they respond with LOL or a funny emoticon. “Uncomfortable Friends” These are the friends that you kind of lost on purpose. This is your ex-girlfriend that crushed you, or the one that you crushed. This is the your roommate that stole your CDs, or you stole his. This is the guy you were with when you did that thing that you have been trying to forget for years. You add them, but hope to God they never comment on anything. They don’t. “Current Aquaintances” – This is the guy you work with. This is the one that you think about before you post a link or tell a joke. This person is the reason you removed the tag of yourself on that picture from college of you and the bra and the boa and the cigarette and the wig and the girl that is definately not your wife (and the garbage can full of “Jungle Juice”). These are people you don’t know that well, but you don’t want them to think you’re a perv or a drunk or a jerk. You know that if post something insensitive or stupid, you are guaranteed to bump into this person at the store or in the hall, and you don’t want to deal with his condescending voice or her Judgy McHolierthanthou look. “Actual Friends” – These are people you are currently actually friends with. You communicate with them in ways other than facebook. You have actual conversations on the phone or face-to-face. If facebook ceased to exist, your relationship would probably not change much. These are the main sets – every one of your friends probably fits into one of these categories. There is little overlap. Below are some subsets. People can belong to one, more, or none of these groups. Feel free to add some in the comments section. The Networking Guy: Invitations to join his company’s page. Updates regularly about his company. The Drunk College Guy/Girl: 575 pictures of self at various parties, occasionally on boat, sometimes in swimsuit, always with cup. Blogger Guy: Constantly pushing his website on people. Has 100 networked blogs followers, and thinks he’s a syndicated columnist.